While actor Arjun Rampal's portrayal of gangster Arun Gawli in Daddy is gutsy, producer-writer Arjun Rampal pushes the audience to discover more plot holes than Mumbai citizens encountered this monsoon, says Prasanna D Zore. Producer-writer Arjun Rampal decides to make a film on the Mumbai underworld and goes about the shindig without calling Dawood, Dawood. 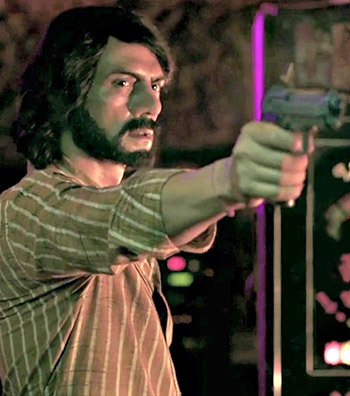 'Dawood' becomes 'Maqsood' in Rampal's Daddy and worse you see one of the most effeminate portrayals of the fugitive gangster played by none other than Farhan Akhtar. Nobody knows the compulsions under which Rampal decided to go with Maqsood and not Dawood, and till the jury is out, Rampal can be spared further criticism. Bollywood, no doubt, along with contemporary media played a pivotal role in glamourising the Mumbai underworld since 1985 with their larger-than-life characters, more Robin Hood-like than they actually were, but with Daddy, a biopic on Arun Gulab Gawli, a mill worker's son who metamorphoses into a feared underworld don and runs his own corporate mafiosi, director Ashim Ahluwalia takes too many liberties with facts and litters the 135 minute saga with plot holes. Ahluwalia though scores smartly in creating an aura around his characters and the film that brings into focus, only temporarily and effeminately though, how the mafia-corporates-politicians troika milked the city's real estate and how each of these players made billions as the city they ravaged watched silently. Ahluwalia's biopic doesn't spend too much time on Gawli's metamorphosis into a gangster, who was co-opted by the politicians of the day and later won an election by floating the Akhil Bharatiya Sena and became a Maharashtra lawmaker. Among the actors, apart, of course, from Rampal, director Nishikant Kamat (Drishyam, Rocky Handsome), who plays a corrupt cop that torments Daddy at Maqsood's behest, Anand Ingale (Babus Reshim), Rajesh Shringarpure (Rama Naik) send shivers down your spine with their cold-blooded acts as they go berserk spilling blood in Mumbai's streets and chawls. My biggest issue with this film is that Rampal plays it safe with facts, events and characters while bringing to the screen the life of one of the most colourful dons -- (ironically, Gawli preferred to always dress in white -- pajama, kurta and Gandhi topi), not character-wise, but because of the colour he added to being a gangster by dabbling in politics and corporatisation of the mafiosi -- of the Mumbai underworld.